Reattachment or oil balls will not occur by hydrolysis of oil into fine particles. Dilution type ( 5-10 times ) so that you will reduce costs. Because of the water-based detergent , there is no limit of stockpile on the fire law. 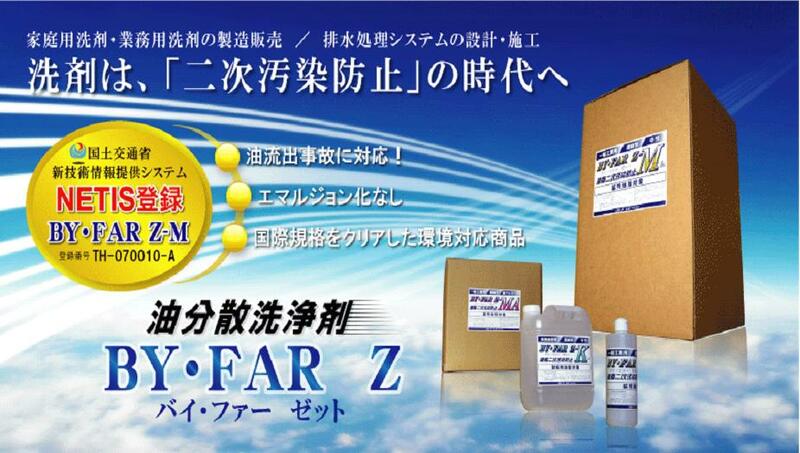 Finely divided oil particles by BY・FAR　Z become small as the microorganisms are easily decomposed, it reduces the degradation time. By proceeding decomposition efficiently , prevent cross-contamination of oil. Use at a dilution of an appropriate amount. Water that can be used , do not choose the environment and places or the quality such as soft water , hard water , sea water , and mud . If it is viscosity like grease oil , temperature of about 60 ℃ is effective . Copyright © SUGAKIKAI KOGYO CO., LTD. all rights reserved.